The history of the Durell Vineyard dates to 1977 when Ed Durell acquired a former cattle ranch in the foothills due west of the town of Sonoma which stretches over three overlapping appellations: Sonoma Coast, Sonoma Valley and a small corner of Carneros. Durell hired a family friend, vineyard manager Steve Hill, to plant and tend the grapes, and he began selling to Sonoma County wineries in 1982. Bill and Ellie Phipps Price bought the Durell Vineyard from Ed Durell in 1997. Upon their amicable divorce, the vineyard was split, with Ellie retaining 60 acres of Pinot Noir and Chardonnay in the Carneros portion of the vineyard and Bill owning 111 acres of primarily Chardonnay and Pinot Noir primarily in the Sonoma Valley and Sonoma Coast portions of the vineyard. Ellie initially produced Durell Vineyard Pinot Noir and Chardonnay under the Sand Hill at Durell Vineyard label. With the 2008 vintage, the label was replaced with Pinot Noir and Chardonnay from the 8.5-acre Ranch House Block of the vineyard under the Dunstan label. The Ranch House Block had been replanted in 2005 with 3.5 acres of Wente clone Chardonnay and 5 acres of Dijon clones 115, 667 and 828 and Calera and Swan selections of Pinot Noir. With the 2010 vintage reviewed here, all clones of Pinot Noir were included. The Dunstan name and its horseshoe logo were inspired by the blacksmith who produced an old and very large horseshoe found when the Durell Vineyard was initially planted and considered an omen of good luck. The initial winemaker for Sand Hill wines was Don van Staaveren. In 2011, Kenneth Juhasz (Auteur, Donum Estate) took over and made the wine reviewed below, assisted by associate winemaker Dan Fishman. The vineyard is open by appointment for tours and tasting (707-933-3839). 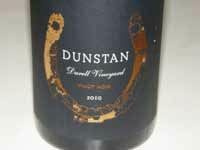 The Dunstan wines are allocated through a mailing list and sold through the Dunstan website online store at www.dunstanwines.com. There is some restaurant and wine shop placement in CA, NY, NJ, TX, FL and CO.
14.1% alc., pH 3.50, TA 0.80, 291 cases, $50. A blend of all five clones in the Ranch House Block. Aged 14 months in French oak barrels. Unfined and unfiltered. · Moderately light reddish-purple color in the glass. Pleasingly aromatic with scents of dark berries, toasty oak and mushrooms on the grill. Impressive mid palate attack of dark red and black berry fruit with a hint of brandy-soaked cherries. A little earthiness adds to the appeal. With a satisfying fullness on the palate, full ripeness, and a long finish, this wine aims to please. On top of that, it has a uniqueness that sets it apart.